I like swallows. They are so swift and elegant birds of prey when diving throught the sky hunting for insects. I like the fact that you can tell by the hight of their flight how the weather is going to be. (True, the insects that are hunted by the swallows indicate that, but they are too small for our eyes.) I like their cry—for me, it is strongly connected with midsummer. I admire their migration. This block represents a somewhat clumsy or chubby swallow. Or maybe it illustrates the rapidity of its movements by showing three or four flaps in one picture. 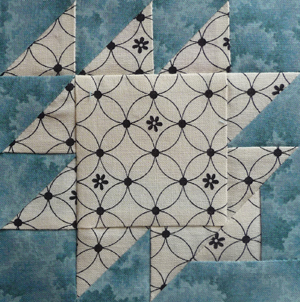 Posted in Uncategorized and tagged farmer's wife, farmer’s wife quilt, quilt, quilt block, swallow, swallow block. Bookmark the permalink.